This is the first time that the independent transport videos cameras have recorded the Taunton Vintage Bus Display & Running Day, now in its second year. The event took place on Sunday 11th May 2014 and was based at the Art Deco style bus station in Tower Street in the centre of Taunton. This is an ideal location as some of the buses attending had spent their working lives operating from that exact bus station! We commence our filming at the start of the day as a wide variety of buses and coaches arrive to take up their duties. These range from Bristol L types, MW coaches, RE’s, both bus and coach variety, K types, and in addition to these, a Bristol LD and FLFs. There is also an RTL from London Transport, AEC Regals, and a lovely selection of AECs, Daimlers and Leylands from northern municipal fleets and some independents, plus many more! Companies represented include Southern and Western National, the Bristol Omnibus group of companies, Brighton Hove & District, Crosville, Wilts & Dorset, and representing the municipals, Blackburn, Bournemouth, Darlington, Huddersfield, Ipswich, Stockport and of course London Transport – to name but a few! Our filming locations include the bus station, Tower Street, Castle Way, Castle Green, Corporation Street and Fore Street. We take a ride to Bishops Lydeard railway station onboard former Southern National Bristol RELL6G, 2700 (HDV 626E) which has ECW B53F bodywork, and was actually allocated to Taunton during its working life. Back at Taunton our filming records the almost non-stop action of these superb vehicles running in service. 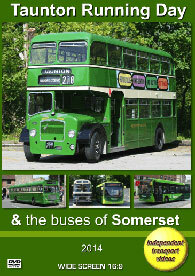 On the current bus scene in the town, First have recently launched and rebranded their operation in the Somerset area as “the buses of Somerset”, introducing a smart two tone green and cream livery. We have also captured these vehicles mingling amongst the preserved ones, and they seem to fit in rather well! On the second part of this programme our cameras return to Taunton in late June 2014 to film the current operations. Here we see a good number of buses in the new livery as well as the “Taunton Park & Ride” fleet operated by First using hired in Wright StreetLites, as their own were in Scotland operating on The Commonwealth Games Shuttle services. Our filming takes place in and around the bus station and in the busy streets of the town. We also make a visit to Bridgwater to record the scene there. A return to Taunton sees the start of the evening rush hour. A good variety of buses are seen, some are former London ALX400s and Plaxton Presidents together with familiar Wright bodied Volvo single deckers and Enviro 200s, some displaying the former First “Barbie” colours. We are sure you will enjoy the vast variety of vehicles shown on this programme against the background of this picturesque Somerset town.